The point is a good one: anyone can come up with some marketing schtick about the importance of leaving a gift in your will. 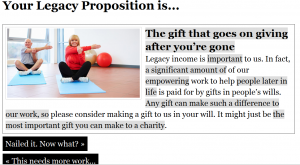 And they make that point cleverly through their ‘Legacy proposition generator’ — 7 simple questions that can help you create entirely bland, generic, cliched sloganeering almost certainly guaranteed to fail. Here’s what mine looked like. Now would this persuade you to leave a gift in your will? I doubt it. And why not? Because it’s slick n’ glib, trite and tested. You could spend time working on a compelling and unique legacy proposition that makes the case for people aligning their life’s values with yours. That positions you as the best steward for the money and assets they have spent their lives building. That makes a case for you becoming part of their ‘family’ – the people and causes important enough to them to be included in their legacy. For advertising to work it has to be personal: representing your organisation’s personal values, and speaking to the individual’s personal values. Simple, yes; easy, no.